The faroles are a Costa Rican homage to the lanterns women carried in Antigua, Guatemala, this night in 1821, as they waited outside the Palacio del Gobierno to find out whether the men huddled within would put an end to 300 years of Spanish rule. 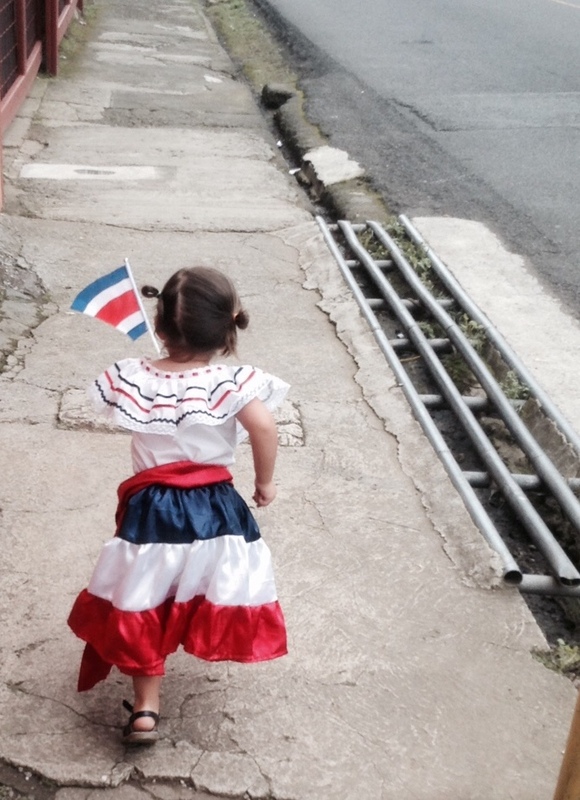 Independence took nearly a month to reach Costa Rica – the vote here was held on Oct. 11 of that year – but September 14th is the night that Costa Rican kids take paper lanterns and march through the streets. It’s always been one of my favorite Costa Rican traditions, although now, thanks to you, I have a real ticket to the show. Your own independence won’t be won overnight, although I know it will feel that way to me. It does already. Tonight we walked around the corner to the neighborhood school and into a noisy crowd of kids and parents, with a warbling, unintelligible teacher’s voice barely audible from somewhere in the building’s innards. A vast city and menagerie of lanterns circled us: houses, pulperías, turtles, toucans, Celso Borges’ soccer jersey. Cars whizzed past and we wondered how this sea of small humans was supposed to launch forth into the traffic, but then a man emerged with a very large flashlight and megaphone, the universal signals of tremendous authority, and beckoned us forward. The school band of xylophones and drums played, for some reason, “When the Saints Go Marching In.” Your dad addressed you in English. I addressed you in Spanish. In that slush of languages and cultures, we plunged into the street. “Look at all the PEOPLE,” you said with deep delight. “Yup. These are your people,” I responded. We watched you revel in your first nighttime parade, an early taste of independence. We watched, conscious that you will take on the world many times in the years ahead, and that we must enjoy these front-row seats while we can. We watched, knowing that our own independence will never be quite the same, we chaperones whose eyes were glued to you, we followers who mirrored your movements left or right, forward or back. We are no longer sovereign states. We have been conquered, fair and square, but that’s just what we’d been hoping for. We surrendered long ago with open arms. Your writing takes me back to Costa Rica every time…..and I love the way you can put into words how so many parents feel but are unable to express.